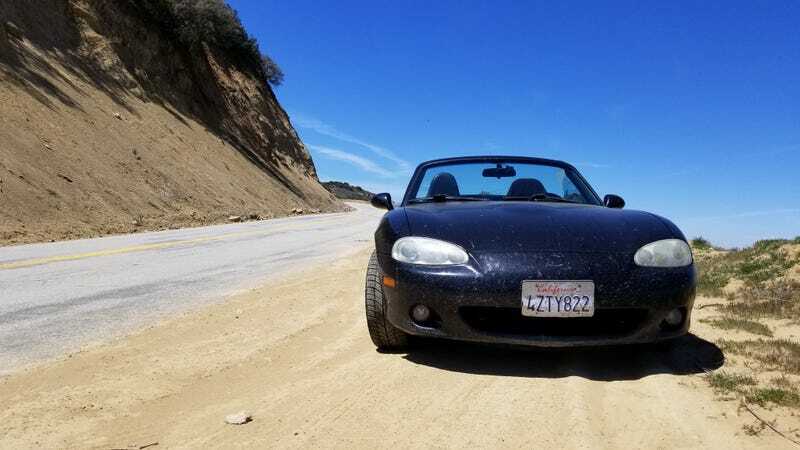 My buddy and I took his Miata for a drive that took us through all but one of California’s climates. Started off taking CA-58 to Soda Lake where he had never been. Tons of people out there enjoying the particularly wonderful weather and super bloom. Tons of BMW motorcycles all day. Like seriously 9/10 bikes we saw were BMW. There wasn’t a cloud in the sky but it was cool enough moving that we kept the top down like 6.5 of the 8 hours we were driving. After stopping at the overlook we took his Miata down a dirt road back to 58. It was fun but my buddy was a bit nervous. We made it and blasted out toward the 58 & 33 intersection.Then we headed south. Stopped in Taft at a wonderful little Taqueria that would make me want to do the drive again just for some good food. After that we headed to a road we found on Google Maps. Hudson Ranch road takes you through Bitter Creek National Wildlife Refuge. Not only was the road almost empty, but it was also amazing to drive! Just look at those views. Plus our little mouse friend that just chilled next to us for a bit and then made his own little burrow. You could see all out to the valley and it was breathtaking. This route took us around Mt. Pinos and the little towns along CA95 and Lockwood Valley Rd. The views were too good to be looking through a screen so we didn’t take a lot of photos. Definitely an area I would like to go back to and explore more. It was gorgeous and some of the restaurants and local places looked really neat. Lockwood Valley Rd while mostly a flat road takes you up and down a small pass before hitting CA33. It was a great pass besides almost being taken out by a Sheriff driving half in the wrong lane on the other side of a crest trying to pass a cyclist. Took CA33 into Ojai were we got fuel and gogo juice for ourselves. You could see the whole coastline from around Port Hueneme to Gaviota. It was stunning and we stood there for a while taking it all in. Then down the mountain to 154 and up Zaca Station Road to Tepusquet Rd and CA166 back to the 101 and back home. If you are in the area I highly suggest Tepusquet. It is tight and technical and lots of fun. After a full day of driving we stopped at Trader Joe’s to pick up ingredients for pasta and a bottle of wine. Proceeded to have a wonderful meal and get a little tipsy from the wine since we both were a little dehydrated. Watched Cannonball Run (my friend had never seen them and I am fixing it). Then drank whiskey while watching F1 China. My god what a boring race that was. and disappointing. But was an amazing day!